Consider that we live in an age when we have more frequent distractions and greater numbers of sources of information than we know wisely how to handle. All we read, hear, see and encounter floods us with sensory overload leading to a dissolution of the context that once provided proportion and meaning to what we analyze. We are no longer starved for details about the world. Instead we are lost in a glut of trivial details where confusion of facts and opinions becomes a widespread problem. Deluged by details most people are unable to determine important from trivial known facts. Some practitioners and specialists are unable to distinguish known facts from fabricated fantasies, or convenient fictions. Fictions are elaborate stories that assist people in understanding an otherwise unclear situation. Some specific legal fictions are created by well meaning folks to generate certainty. The need for certainty where, too often, there is only vague feelings, unexamined emotions or prejudices that shape our "misunderstanding" of everyday events, is understandable, but not desirable. An overt goal of all my classes is to challenge our shared prejudices and examine our follies in the light of gentle dialogue. This is done with respect for you as a source of individually inherent value. The aim of this challenge is to allow you to exercise good judgment in distinguishing between trustworthy, widely accepted facts and erroneous but commonly held fictions. Unless we practice reasoned discourse, respect for the beliefs of others, and an honest commitment to substantiated facts we run the risk of indoctrination. Any set of unexamined ideas that rest on shared fictions has the potential of leading us toward a fatally flawed, fascistic acceptance of the "general will." One purpose of a Liberal Arts education is to nourish the soul to unshackle the mind to behave in ways that harm no one. 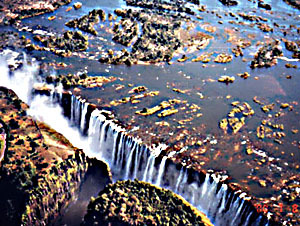 Victoria Falls on the Zambezi River between Zimbabwe and Zambia, 2000; Barbara Siry. Here are some more pages to assist you in what you need to know about me as an educator. Darwin was right, so get used to it! Global Warming's here now. 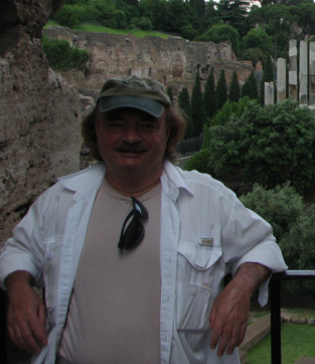 My mission is to stimulate inquiry and offer participants in my classes opportunities to think critically about ecological and social problems in order to solve complex disputes about policy by applying, when appropriate, a body of scientific and technical knowledge. 2002-2003 River Restoration Project Coordinator, Florida Defenders of the Environment, Gainesville. 2001-2002 State Director, Natural Resources Defense Council’s Florida Climate Alliance. 1986-1991 Editor, "Practicing Essentials," North American Environmental Education Association's Environmental Studies Section Newsletter. 1988-1993 Associate Professor, Environmental Studies, Applied Quantitative Systems, and Master of Liberal Studies Departments, Rollins College. July 1990 - "Culture, Energy and Ecology around the World"
January 1991 Tour of 21 countries including: Peru, Australia, India, Africa, and the EU. "Earth Summit"; Rio de Janeiro, Brazil, June 2-10, 1992. Masters of Liberal Studies: M.A. thesis Advising, Supervision, and Sponsorship. Print Version of Curriculum Vita. 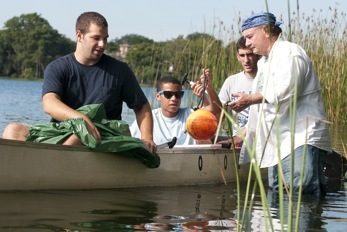 With first year students on the Lake's edge, Fall, 2010.